Pioneers in the industry, we offer hydroquinone tretinoin mometas (skin - n - shine cream), diclofenac linseed methyl salicylate menthol (decloneb gel), clindamycin nicotinamide (ance clean gel) and cloletasol gentamycin miconazole clotrimazole ( declobet gm) from India. With the inclusion of advanced technology, we are engaged in offering a comprehensive range of Skin - N - Shine Gel. 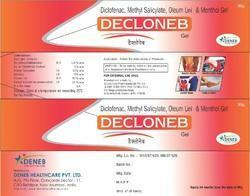 The offered gel used as a skin bleaching agent, to lighten the appearance of the skin. Moreover, it inhibits an enzyme known as tyrosinase, which lowers the amount of skin pigment formed in the skin. We offer the entire array in varied packaging options as per clients' diverse needs. 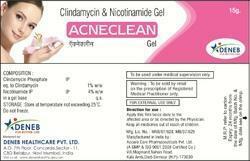 We are engaged in offering high-quality Acne Clean Gel that is used to treat acne. It helps to decrease the number of acne lesions. It works by killing sensitive bacteria that cause acne and reducing the amount of free fatty acids that irritate the skin surface. In addition, these capsules are severely tested on well distinct parameters to ensure its quality.